mayordomo mayor, OCast villicos,villicus Eng Lord Chamberlain or Lord Chamberlain of the Royal Household, Chief Bulter. This position was held by trustworthy nobles, who spent various months per year living with the royal family. It is the highest position in the household under the lord. The chamberlain was the general coordinator of the royal staff. It was not necessarily a political position. He deals with and issues orders to all the servants and those holding other positions in court and sees to it that they are carried out. The chamberlain is economically responsible for reporting ordinary supply costs to his lord or king, his supervisor, and to keep him informed of the prices of all purchasable articles. In England, aristocratic positions in royal and noble households could be held by more than person in order to provide time for the individuals to return to their manors to take care of their estates. 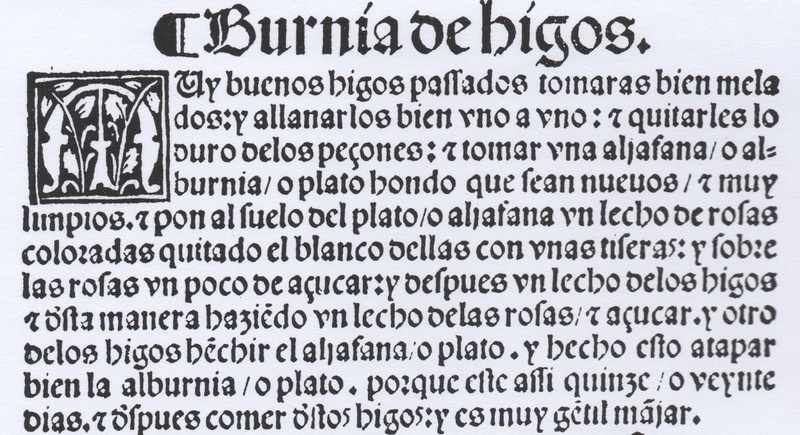 The Mayorodomos mayores of Henry IV (1455-1474) were Beltran de la Cuenca, Duke of Alburquerque, Miguel Lucas de Iranzo, Constable of Castile and Andrés de Cabrera, Maruqes de Moya (husband of Beatriz Bobadila, the most influential woman in Isabel I’s court). Lord Chamberlains of the Royal Household during this period were: Thomas Stanley, Richard Neville, the Earl of Salisbury (father of the Earl of Warwick) under the rule of Henry VI and Lord Hastings under the rule of Edward IV. A sideboard was located at the side off the banquet hall. Cheeses, cold cuts and sweets were laid out for the household to nibble between meals. The Mayordomo might have ordered this dish for sweet tooths! Cut off the stems of mature figs. Slice the figs in half. 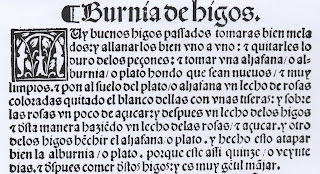 Select a glazed earthenware basin or pot, which used to be called búrnia or albúrnia (see alboronía). Line it with a layer of rose petals. 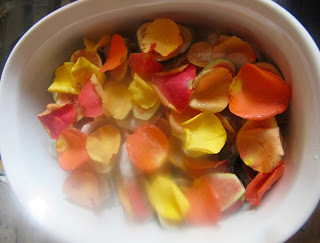 Sprinkle with sugar and add layer of figs, followed by another of rose petals, sugar and figs. Repeat until there are no more figs. Cover the pan tightly with aluminum foil. Secure with masking tape if necessary. Place the lid over this. Let it sit 15-20 days. The figs should become sticky with the syrup they give off during this time and the petals will become impregnated with the aroma of roses. Then this mixture is ready. 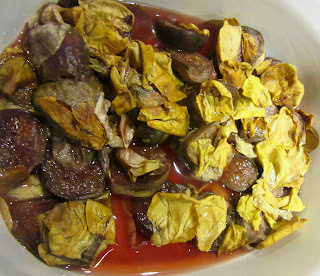 The preparations can be made with dried or fresh figs. The latter are recommended.